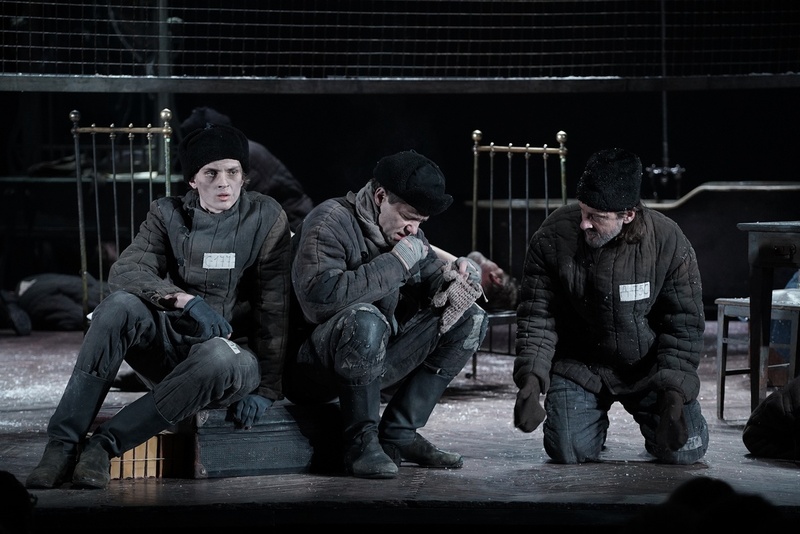 The Maly Drama Theatre of St Petersburg’s stage adaptation of Life and Fate, Vasily Grossman’s epic novel about the holocaust, the second world war and Stalinism, above all brings hope for the future. The play, being shown this month (in Russian, with English captions) at the Theatre Royal in London, portrays the darkest days of 20th century European history. What conveys hope is how determinedly its director, Lev Dodin, and its cast stare Soviet history in the face. The impact was especially forceful last week, when Russian officialdom was as usual celebrating the “great patriotic war” with vast, aggressive displays of military hardware (on 9 May, the anniversary of the defeat of Nazi Germany). But that’s only one Russia. The Maly Drama Theatre reminds us of another, where past wars are not justified or reproduced, but thought about, along with the repression and prison camps that accompanied them. Such thought is a precondition for making a future without any of these things. Life and Fate was written in the 1950s, suppressed in Soviet times, and published in Switzerland in 1980 and Moscow only in 1988. It is set in 1943, when the battle of Stalingrad turned the tide of the second world war against Germany. The central characters are Viktor Shtrum, a physicist, and his wife Liudmila. Grossman’s novel includes in its panoramic sweep scenes at the battle of Stalingrad; along the Volga river, following a voyage by Liudmila’s sister Zhenya; in the ghetto at Berdichev, Ukraine, where the Jewish population was killed under Nazi occupation; and in Russian and German prison camps. Grossman, a journalist of Jewish heritage, won fame with his realistic war reporting, including the first report of the liberation of prisoners from a Nazi concentration camp. His first novel about the war, For a Just Cause, was published to acclaim in 1952, but the honesty of Life and Fate and other subsequent writing was too much for the Soviet censors. Lev Dodin’s stage adaptation puts front and centre two types of anti-semitism. 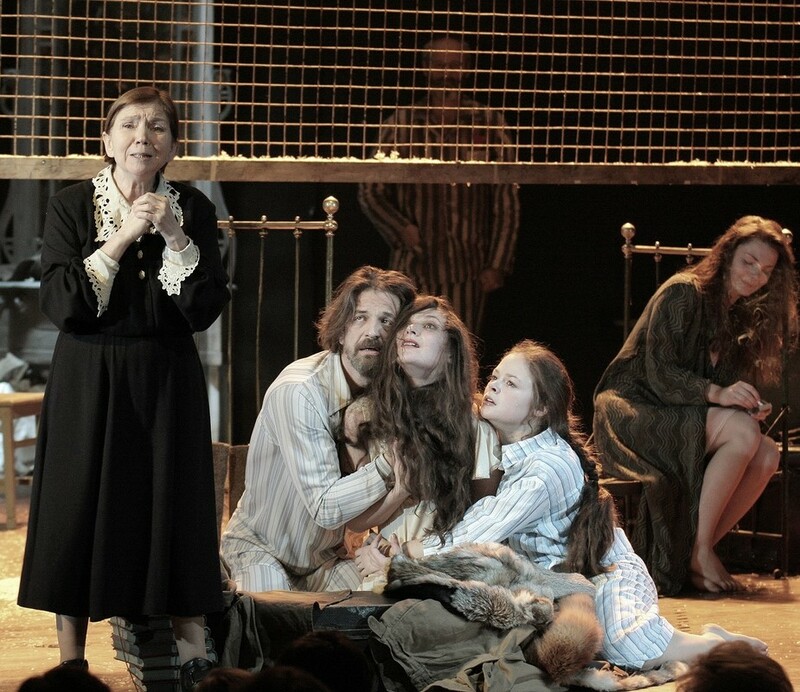 The genocidal anti-semitism of the Holocaust is portrayed in the last letter of Anna Shtrum (played by Tatiana Shestakova) to her son Viktor, describing life and death in the Berdichev ghetto. The play starts, and is punctuated throughout, with readings from the letter. Stalinist repression is a central theme. The stage version well conveys Grossman’s sensitivity to the way that the system of arrests and shootings was glued together by fear, guilt and the destruction of people’s morale. Those who survive their relatives are tortured by guilt; those who escape arrest are tortured by fear of it. Liudmila Shtrum’s sister Zhenya (Elizaveta Boiarskaia) is haunted by the thought that she may inadvertently have betrayed her first husband, the veteran communist Krymov (Alexy Zubarev), by saying too much to her lover Novikov (Sergey Vlasov) – and by the thought that Novikov might have betrayed her. But Novikov, the commander of a tank division, is himself eaten up by the repressive machine, for the “crime” of waiting eight minutes before executing an order to advance, in the hope of minimising fatalities among his troops. Grossman’s novel reflects on the crushing of the hopes raised by the 1917 revolution, and the relationship of those hopes, and the socialist ideals that accompanied them, to Stalinism. Here I felt that the stage version lost some of the complexities. On the other hand the novel’s exceptional and forthright comparison between Stalinism and Nazism is powerfully rendered, especially in conversations between the Gestapo officer Liss (Oleg Dmitriev) and the veteran communist Mostovskoy (Igor Ivanov), one of his prisoners. Liss mocks Mostovskoy’s internationalist principles and forecasts that Stalinism, as it scraped the bottom of the anti-semitic barrel, would resemble Nazism more closely than Mostovskoy can bring himself to admit. Dodin has achieved a feat by compressing into a three-hour-plus performance so many of the complexities of Grossman’s novel. One set, bifurcated by a net and with the Shtrum’s furniture front of stage, is used for every scene, allowing the action to shift rapidly from the Shtrums’ Moscow apartment, to Soviet and then German prison camps, and in one scene to Stalingrad. In 1961, when Vasily Grossman sought permission to publish Life and Fate in the Soviet Union, a senior Communist party official, Mikhail Suslov, told him it would not see the light of day “for at least 200 years”. Grossman died in 1965, not knowing whether his novel would ever be read. A half century later, one of Russia’s leading theatre companies is conveying, developing, and expanding on, the novel’s themes. I think that’s progress: reflection on the past takes time. GL, 14 May 2018. Q. Do you think the comparison [of Vasily Grossman’s Life and Fate] with War and Peace [by Lev Tolstoy] are justified? LD. It’s the closest analogy. No accident that the European press called Life and Fate “the War and Peace of the 20th century”. Tolstoy’s novel really isn’t only about Napoleon and Russia: it’s a novel about humanity – yes, using material in Russia, because Tolstoy lived here. And Life and Fate is based on material from the Soviet Union, because in those most tragic years Vasily Grossman lived and worked here. Everything is brought together in the novel: his war experiences; his mother perishing in the ghetto; and the fact that Grossman was one of the first in Europe to witness the hell of the fascist concentration camps. He accompanied the [Soviet] army to [the Nazi death camp at] Treblinka [in Poland]. Grossman’s novel has so much to say about Russian, and European, history. Q. You worked on this play for nearly three years. Was that because of the scale of the subject matter? Q. Are you sure that all this [history] is topical today? LD. Great literature never loses its topicality. The problem of choices, for example: every one of us makes choices, every second. Even if we refuse to make moral choices, that is already making a choice, an irrevocable choice. What could be more topical than to remind people now about morality? And our history? Anyone who fears dealing with the terrible past is preparing a terrible future for himself. And the issue is not direct repetition: the relationship is much more complicated, nuanced. It needs to be grappled with. As long as we don’t feel that each one of us is responsible for what happens, nothing will change. As long as there is a Gulag [prison camp system], as long as there is injustice – I am imprisoned in the Gulag, and I am a victim of injustice. Even if that injustice has not yet hit me directly. What could be more topical? Q. And did the Gulag directly hit your family? LD. My family – no, but, as they say, the shells fell all around us. My father was a prominent scientist, a geologist. I very well remember how in 1949, when I was five years old, my mother, sister, brother and I were living at our dacha [country house] in the summer, and we would often go to the local station to meet the last train [from Moscow]. My dad would always take the last train. And sometimes he wouldn’t be on it. My mother would literally turn white, because at that time, at the Institute where my dad worked, there were [political] meetings. They would arrest faculty members – and not only Jews – and they often did so after these meetings. We had to live through that fear of our father not returning. I still remember the name of his teacher, Eidelman, a very celebrated scientist, one of the founders of the Geological Committee of the USSR. He was 84 years old. They imprisoned him, and he disappeared. Q. You have said that during rehearsals some of your students’ parents reacted indignantly to your proposal to base a performance on Grossman’s novel. LD. Yes, at the beginning we had that problem. Some of the parents were admirers of Stalin, either covert, or very overt. And for some others, maybe, the theme we were working on simply wasn’t important. The mother of one of our women students was very indignant at the start. But after the dress rehearsal, she spent the whole night talking with her daughter. I think they began better to understand each other as a result. Another of our women students learned just recently that her grandad, a peasant, had suffered repression [under Stalin], and been shot. Her parents just hadn’t said anything to her about this before. Q. Even before the premiere in St Petersburg, you showed the play in Norilsk [formerly the site of an extensive group of prison camps]. How was it received? Q. It’s quite common to hear people say, these days: “Why dig us the past? Everything’s there in school history textbooks, after all.” Somebody I know always tell me that the only people who want to think about these things are those whose families suffered repression. LD. What an awful, enslaved mentality! The past is there exactly to be dug up. The past: that’s all the experience we have to go on. There is horror in the future, that we don’t yet know, and, so that the future can be less horrible, we need to dig up the past. And study it. In Russia there are always people who don’t want to know their history, or get it all confused because they are so scared of finding something bad. In Germany, for example, not a year goes by without serious research being published on the Hitler period. Films and plays on that subject appear one after the other. Although that period was shorter, and our [Soviet] system existed for nearly a century. Maybe it’s because of that we don’t want to deal with it? Because we are all children of that system? In my opinion that’s that system’s most awful influence – a sign of the fact that it is still alive. As long as we don’t understand that the responsibility for that system was borne not only by Stalin, not only by the party, b ut by all who allowed that system to exist, we will continue to live in the past. Q. That sounds pessimistic. And if you are a pessimist, why did you put on this play? LD. For one thing, for myself. For another, because you can not stay silent in the face of that, that you consider to be false – for your own sake, and for the sake of those who are able to listen. And pessimism is not such a negative quality. It is a way to avoid disillusionment – although it doesn’t avoid responsibility. This was one of Grossman’s points: pessimism requires courage. It requires you to do things that optimism will never do. This entry was posted on Monday, May 14th, 2018 at 7:05 am and is filed under History and prehistory. You can follow any responses to this entry through the RSS 2.0 feed. You can leave a response, or trackback from your own site.